Ben Robinson|GoBuccs.com Covington’s Gray Harshbarger shoots against Lehman Catholic’s Bryce Kennedy Tuesday night at Covington. COVINGTON —- The Covington boys basketball team led from the start in a 55-44 win over Lehman Catholic Tuesday night. The Buccs finished the first quarter on a 9-3 run to go in front 14-9. Covington increased the lead to 38-24 at halftime and still led 47-36 after three quarters. Chad Yohey scored 15 points for Covington to lead all scorers. Gray Harshbarger added 11 and Kleyton Maschino added nine. Bryce Kennedy and Branden O’Leary scored 12 points each for Lehman and Elliott Gilardi added six points. Covington converted on 15 two-pointers, three treys and made 16 of 24 free throws, while Lehman made 12 two-point buckets, 4 three-pointer and was 8-of-13 from the line. Covington will play at Houston Thursday and Newton Friday to close the regular season. Lehman, 7-12, will host Lima Temple Friday, Fairlawn Saturday and Mechanicsburg Tuesday to close the. regular season. HOUSTON ——— The Houston boys basketball team picked up a 71-42 win over Bradford Tuesday night. Houston led 27-11, 44-20 and 60-30 at the quarter breaks. John Leist and Peyton Arnold scored 14 points each for Houston. Tristin Freistuhler netted 13 and Jairon Douglas added 11. Gage Wills led Bradford with 16 points and Connor Jones added 11. Bradford, 0-19, will host Tri-County North Friday and Southeastern Saturday, before traveling to Parkway Tuesday to close the regular season. Houston, 6-14, will host Covington Thursday and play at Russia Friday to close the regular season. 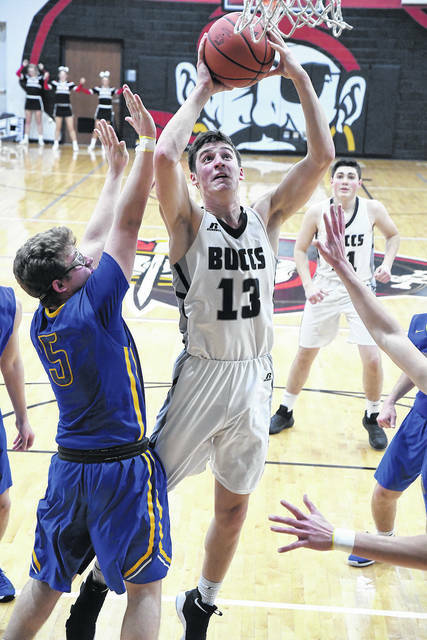 RUSSIA — The Russia boys basketball team defeated Newton 57-38 Tuesday. Russia improved to 13-6 overall, while Newton dropped to 6-14. Russia will host Houston Friday, Marion Local Saturday and Anna Tuesday to close the regular season. Newton will host Covington Friday and play at Tri-County North Saturday to close the regular season. https://www.dailycall.com/wp-content/uploads/sites/30/2019/02/web1_gray-harshbarger-2.jpgBen Robinson|GoBuccs.com Covington’s Gray Harshbarger shoots against Lehman Catholic’s Bryce Kennedy Tuesday night at Covington.